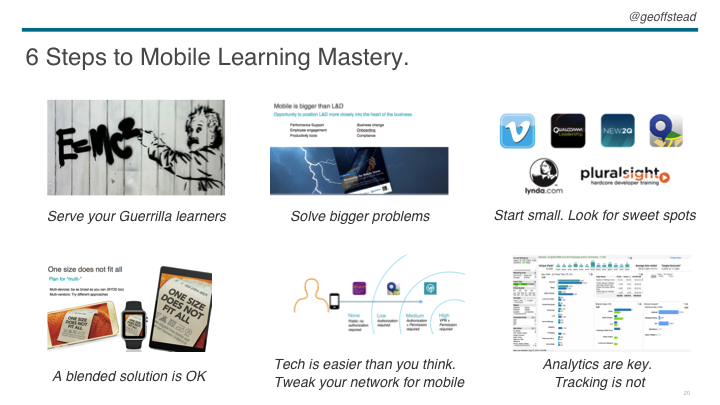 I was recently invited to keynote at a very exclusive mobile learning summit in Toronto. 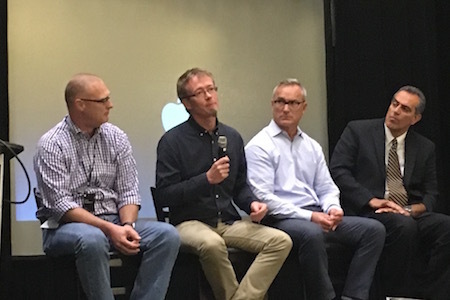 Hosted by swissvbs, I shared the stage with Apple and GE to explore of how Toronto’s top businesses are (and could be) using digital learning. A strong theme all the way through was how mobile is unifying the traditionally diverse fields of L&D and Performance Support, one I could certainly agree with. Regular readers will remember we released a free white paper on this, co-written with those gurus of performance support, Bob Mosher and Con Gotfredson. If you haven’t read it yet, check it out. 1) Serve your Guerrilla Learners. Structure your learning offer around those top performers who are too busy to attend your classes. If you can engage them, you are winning. 2) Solve bigger problems. L&D is no longer about training courses. It’s about business performance. 3) Start small. Look for sweet spots. Focus your first mobile learning on the lowest risk, biggest gain content. 4) Blended solutions are OK. Maximise your future proofing by supporting BYOD. Your learners hop devices all the time – support as many as you can. 5) Tech is easier than you think. If your e-learning vendor says it’s to hard – find another one! Old school platform providers DO find it hard to adapt, but there are many new solutions that can act as a mobile friendly bridge to a more modern apps. 6) Analytics are key. Tracking is not. Analytics helps you optimise your learning strategy by confirming which content works well, and highlighting what your learners are searching for. Old school e-learning tracking is mostly irrelevant on mobile, apart from a few unique cases. I hope some of these tips are useful to you. If you have others to add, please do so in the comments. My hosts at the event, swissvbs are specialists in mobile learning and have recently launched echo, a learning reinforcement app that builds on forgetting curve / memory optimising approaches to help make your learning stickier. It is a little bit like the Jargon Buster app we made at Qualcomm, but with all sorts of customisations that make it easier to drop into your own business. Check out echo and let us know what you think. ps: they also run great events. Our surprise guest was UK comedian Omid Djalili who was excellent! Should I go Native, Hybrid or HTML 5? Key Lessons from L&T Conference – Keeping it real & changing roles of L&D! Is the latest flurry of mobile research and benchmarking telling L&D what we need to know?